We offer many kinds of agate coffee tables , agate side table with various tabletop shapes, Such as round ,square, rectangle and custom. As agate has natural(grey color) and dyed color(blue, yellow, purple, white, black, red-). So it is very easy for your to find out your favorite color. This model of grey side table base is made of iron and the iron base has crown color with very classic and simple design, base and top has the best color match. The around nesting side tables are suitable for living room to make the living room more warm and comfortble. semi precious slabs series-- grey round side table top, surface finish is polished. The diameter of round agate side tabletop is normally 80cm,thickness is 2cm (normally 0.5cm grey agate +1.5cm natural commercial stone or artificial stone/glass/Acrylic, max diameter can 120cm, size can be custom. The square tabletop available ,base size can be 60(cm)*70(cm), base can be blue agate too, also can be wood or metal stand. 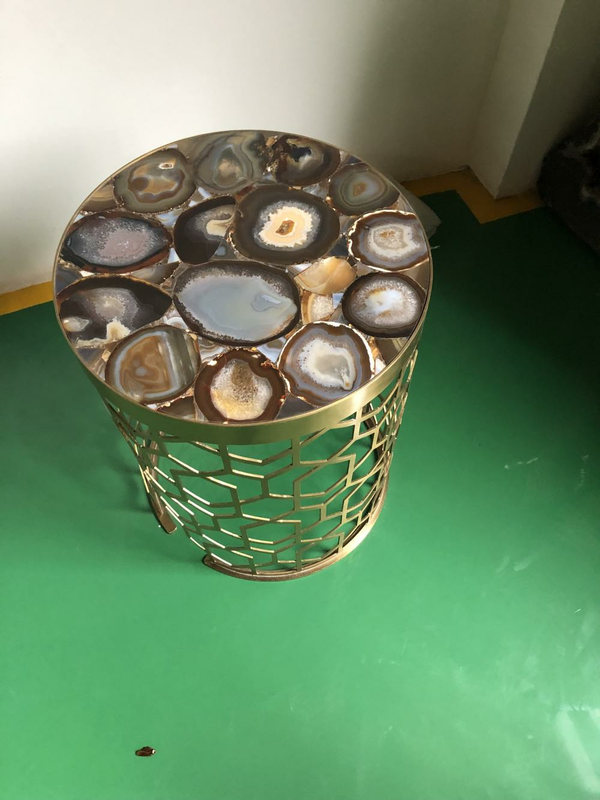 We normally produce agate side table with small agate slice , if you prefer this grey agate table to be translucent, you can laminate the tabletop with glass or acrylic. Translucent grey agate table is full of bright and fantastic colors and warm atmosphere. Size: diameter 80cm ,thickness is 2cm (normally 0.5cm grey agate +1.5cm natural commercial stone or artificial stone/glass/Acrylic),ship is round(square is available) and size can be custom. Looking for ideal Semi Precious Stone Table Top Manufacturer & supplier ? We have a wide selection at great prices to help you get creative. All the Round Side Table are quality guaranteed. We are China Origin Factory of Round Nesting Side Table. If you have any question, please feel free to contact us.